After many years of disappointing editions, everything finally clicked for the Delta Jackpot last year. The 2012 edition of this race was won in brilliant front-running fashion by Goldencents. He defeated a very respectable field that included Itsmyluckyday and Mylute, the eventual second and third-place finishers in this year's Preakness Stakes. A fairly promising field of ten is assembled for this $1,000,000 affair. The 5/2 morning line favorite is Coastline, whom we must oppose in here. 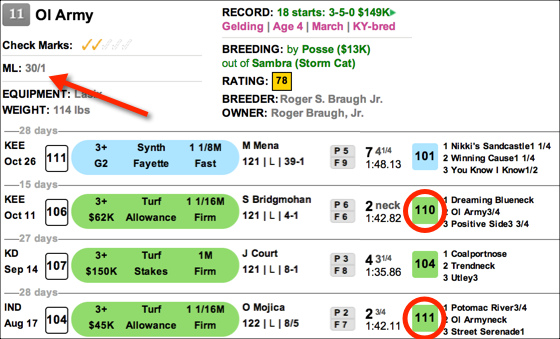 The TimeformUS Race Ratings indicate that the lightly raced Coastline has competed in three races against weaker competition than he faces today. His speed figures range from 85 to 91, and he will need a clear-cut lifetime top to win. This son of champion sprinter Speightstown is also making his two-turn debut. It wouldn't be a shock if he won, but his work is certainly cut out for him. 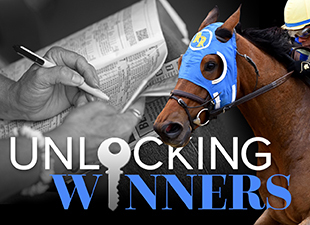 The two horses who absolutely must be keyed are #8 Casiguapo and #10 Rise Up. The Calder-based Casiguapo performed admirably in his two New York starts. He finished a distant second in the Hopeful and was a sneaky-good fourth in the Champagne Stakes--both races against much better competition than he faces today. Casiguapo was assigned a field-best speed figure of 98 last time out, and he's been freshened and pointed to this off of a 49-day layoff. Given the $1 million purse, you have to believe that for these obscure connections, this race is the Breeders' Cup and Kentucky Derby rolled into one. Rise Up was excellent over this racetrack while winning the Jean Lafitte by 6.5 lengths 28 days ago. That was just his second start for trainer Tom Amoss, who owns an overall TimeformUS trainer rating of 100 (the maximum). Rise Up has yet to break through his top speed figure of 95, run for previous trainer Tim Hamm, and if he does today, it will almost certainly be enough to score a victory. The TimeformUS Pace Projector indicates that Rise Up should be on an uncontested early lead if jockey Gerard Melancon wants it that way, and based on Melancon's 43% win rate with Amoss-trained horses, it's certainly easy to trust him to ride a smart tactical race. If there is a longshot worthy of exotic inclusion, we believe it is Mighty Brown, who was a good second with an 86 speed figure in the local prep for this race. He projects a beautiful mid-pack trip and has the look of a rapidly improving horse who should stay the distance and possibly get a piece. Betting Strategy: Exacta box of Casiguapo and Rise Up. Include Mighty Brown with them in the trifecta. A full field of 14 is assembled for a wild edition of the River City Handicap. On recent form, 7/2 morning line favorite Keep Up and 5/1 morning line Coalport are very much contenders who deserve inclusion in exotic wagers. However, neither of the two will offer enough value to justify the short prices in what is a skullbuster of a race. Indeed, in a race that is this wide open, it is best to stab with horses who offer long odds and can be contenders if able to work out a good trip. Ol Army (30/1 morning line) is the only horse in the field who has managed to run three speed figures of 110 or better in his last four turf races. He achieved each of those three 110+ figures when able to secure an early lead. The one time he failed to make the early lead over that stretch, Ol Army could manage a figure of only 104. The TimeformUS Pace Projector indicates that Ol Army should find himself on an uncontested early lead, and at his favorable low weight impost of 114lbs, he could prove to be an elusive target on the front end. Two other potential longshots also merit exotic consideration. Olympic Thunder (12/1 morning line) has numerous turf figures that make him competitive. If he is able to work out a trip, he should be a big factor. The other is the intriguing Juddmonte Farms import Kalamos (15/1 morning line). He doesn't have a strong case on speed figures, but his turf top of 102 came during August of his three-year-old season in France. His win over the polytrack at Keeneland last time out was visually impressive, as he overcame a troubled start while off a 417-day layoff. Kalamos is aggressively spotted by Bill Mott, and he is a horse who has wildcard potential. Betting Strategy: Win bet on Ol Army. Use the following horses underneath him in the exotics: Keep Up, Coalport, Olympic Thunder, and Kalamos. The Real Quiet has attracted a field of eight two-year-old colts and geldings who will be running 1 1/16 on cushion track. At this young Hollywood Park meet, races at this distance have been fair to all running styles. Frontrunners, stalkers, closers, and even deep closers have all enjoyed success. However, races at this distance give the horses only a short run to the first turn, which can leave horses in outside posts at a disadvantage. According to the TimeformUS Pace Projector, this race is likely to unfold at a fast pace, which could well end up giving closers an advantage. Beach Hut is projected to have a clear early lead, with Karma King and Better Bet falling in immediately behind him. Green Mask is a relatively close fourth, and Life is a Joy is a stalking fifth. The others should be considered closers today. Tamarando is the morning line favorite, at 5-2, and he figures to be the favorite when the gate opens. This Jerry Hollendorfer-trained colt is simply the most accomplished horse in this field. He has won a Grade 1 sprint and finished third in a Grade 1 route. He has a string of strong speed figures. He is proven on synthetic surfaces. He made a big late run against the much-talked-about speed bias in an undercard stake on Breeders' Cup Friday. He figures to be favored by the fast pace today. His trainer and rider (Bejarano) are popular and about as good as trainers and riders get. There is much to like here, and, without question, Tamarando is a strong contender, but we are finding it hard to shake the feeling that he will be an underlay in this race. He has yet to win around two turns. His speed figures, while strong, do not tower above those of his rivals. Much as we respect Tamarando, we are going to take our chances against him in the top spot today. The second choice on the morning line, at 3-1, is Wesley Ward's Green Mask. Green Mask won his debut at Keeneland in wire-to-wire fashion (earning a nice speed figure of 83) and now ships west and tries two turns in a race in which the Pace Projector projects him to be in fourth place early. That is too much for us to take at a short price. We are tossing Green Mask. At morning line odds of 7-2, Beach Hut is our selection, even though his running style figures to put him into the teeth of a fast pace, and even though his outside post is a disadvantage. Our case for Beach Hut is a simple one: We think he is the most talented horse in this field. His debut speed figure, a 93 earned on real dirt at Santa Anita, is faster than any number his opponents have ever run. From a visual standpoint, the effort was superb. It was the kind of effort that makes the viewer itch to see the next one. He pressed a fast pace from the outside, handled everything he encountered with consummate style, and ran away from his opponents in a manner that suggested he has at least some chance of becoming something special. Beach Hut will be making his first start around two turns today, as well as his first start on synthetic. His TimeformUS Pedigree Rating for synthetic routes is a mediocre 66. However, his trainer, Bob Baffert, gets a powerful 96 rating with first starts on synthetic, as well as a 92 rating going from dirt to synthetic. 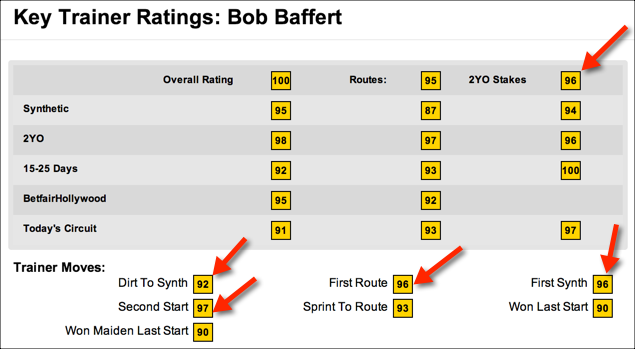 In addition, Baffert gets a 97 rating with second starts, a 96 rating with first routes, and a 96 rating in two-year-old stakes. We also plan on making strong use of Life is a Joy, who was compromised at the start of his last race and still made a long, grinding run against the bias. Electric Eddie is a longshot (12-1 on the morning line) who should be kept in the mix. The On Trust Handicap at Betfair Hollywood Park features a group of up-and-coming types along with wily veterans. They will be competing on the cushion track for $100,000. Although the race is restricted to Cal-bred horses, this is a capable and well-matched group that has among it a horse who ran in the 2012 Kentucky Derby and several others who have competed in Grade 1s. The seldom-run 7.5-furlong distance of the On Trust has attracted sprinters as well as middle distance runners who should have ample time and opportunity to make a late bid. In the absence of any real standout, our inclination is to look for a strong contender who will be a bit of a price, and we think we have found one in Mobilized. When analyzing how experienced horses such as these might fare when attempting a given distance and surface, this writer rates past performances ahead of breeding. Although Mobilized has a weak Pedigree Rating of 58, you will note that the venerable seven-year-old has run this unorthodox distance three times at Betfair Hollywood Park, and in all three races he ran extremely well. A little more than a year ago, he thrashed a similar field of horses in the $125k Tiznow Stakes, a virtual facsimile of today’s race. There’s reason to think that Mobilized has been primed for the On Trust Handicap. He has raced only three times as a seven-year-old, and his last race, a downhill turf race at Santa Anita on October 19th, could have had the effect of tightening him up for this spot. Unambitiously placed early on, he still made his usual late run to get within four lengths of the leader at the wire. Since then, he has had three workouts, and today he adds jockey Corey Nakatani. Mobilized has run decent speed figures of 101 and 102 in his two synthetic sprints this year, and, while it is generally risky business to play seven-year-olds to get back to strong old figures, we believe that Mobilized can take a step in that direction today, which would make him very competitive in this spot. Moreover, his trainer, Gary Mandella, gets solid TFUS Trainer Ratings of 80 in Hollywood Park sprints and 87 with sprinters receiving race spacing similar to today's. The other horse to consider (if you don't mind taking a relatively short price) is the four-year-old Rousing Sermon, whose lifetime-top speed figure, a 114, came over this surface. This is a colt who has been running mainly in two-turn routes and now cuts back to one turn for top trainer Jerry Hollendorfer, who gets a 78 rating with route-to-sprint moves. The TimeformUS Pace Projector indicates that this race favors horses on or close to the early lead. While this doesn’t stop us from liking the late-running Mobilized, it does make Rousing Sermon look like a particularly strong play. It’s a powerful handicapping angle when a horse who has been running in routes cuts back to one turn and still projects to be close to the early pace. In this case, Rousing Sermon figures to sit in the garden spot behind Compari and morning line favorite Cyclometer. We give him a great shot of running past those two at the top of the lane and feel he is the most likely winner of this race. The Play: Exacta box of Mobilized and Rousing Sermon, emphasizing the latter on top. Mobilized and Rousing Sermon in multi-race wagers. Rousing Sermon with ALL with Mobilized in trifectas.